If you still have issues browsing this site with Firefox, please let me know. Over the past couple of weeks, I received a number of e-mails from people reporting that their FireFox browser crashed when browsing my site. At first, I couldn't reproduce the problem but then someone reported they were using Firebug, a very helpful developer's tool that I had installed, but not enabled. I re-enabled Firebug on my browser and opened an article on my site. It instantly crashed. I am not exactly sure what's causing it, but it seems it has to with the loading of the Google ads on my page, as suggested by reader Jake. 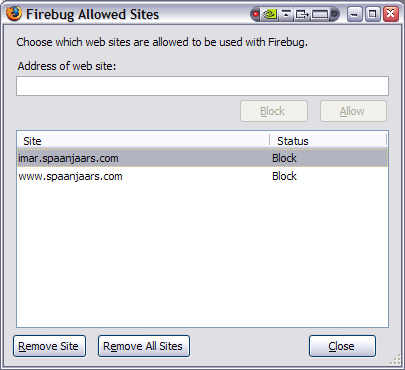 Start FireFox and choose Tools | Firebug | Allowed Sites... from the main menu. Click Close and then restart FireFox. You should now be able to view articles on my site. To enable you to view this article without the changes made in Firebug, I disabled Google ads on this page.